Tuesday is as good a day as any - we call it 'Test it Tuesday'. Why not set a weekly alarm on your phone to remind you? Why do we need smoke alarms? Fire strikes when you least expect it, often during the night. If you are asleep when a fire starts and you don't have working smoke alarms to wake you, your chance of surviving is virtually zero. Fire spreads very quickly - the real killer is the smoke. People cannot smell smoke - when you are asleep you lose your ability to smell. It only takes 3 or 4 breaths of the toxic fumes to suffocate you and family members. 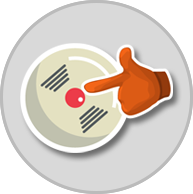 A smoke alarm is an early warning system which warns you almost as soon as a fire starts and gives you and your family time to alert everyone and to escape safely. Smoke alarms should be placed on each level of your home. Smoke alarms should be fitted on ceilings. Ideally, one in your hallway and one on your landing. Test smoke alarms weekly, (Test It Tuesday) even if they are mains powered. Smoke alarms should be vacuumed at least twice a year to remove any dust or insects. Replace the battery annually, give it a birthday unless the alarm is fitted with a 10 year sealed battery.